I have been annoyed many times by the screen saver kicking in halfway through a Flash video or an SMPlayer session. No amount of fiddling with settings (SMPlayer) helped and disabling the screen saver all together was also not an option. While browsing through the excellent Linux Journal website, I came across this tech tip about a utility called Caffeine. It's a nifty little utility that runs in the task bar and activates whenever Flash video is being played. 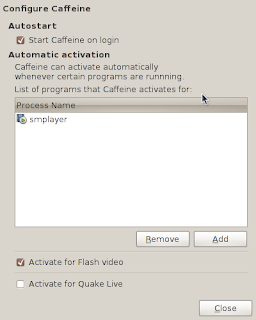 It can also be configured to activate whenever a certain process is active - so that solves my SMPlayer problem as well. You should be now able to start Caffeine by typing caffeine in the command line or by clicking on Applications > Accessories > Caffeine. When Caffeine starts, an icon of a coffee cup will appear in the task bar. Right click the icon to set the properties. My current settings can be seen in the screenshot.